Amazon Prime’s The Romanoffs -- created, written, and directed by Mad Men creator Matthew Weiner -- has a bizarre, yet simple, premise: The anthology-style show follows a number of families who all claim to be descendants of the Romanovs, Russia’s last royal family, whose deaths during the Russian Revolution were the final paving stone on the road to the communist Soviet Union. So, what exactly is the big deal about this family, and why does everyone in this show want to be one of them? To fully understand, we need to travel a few hundred years back in time, because Weiner's work is nothing if not steeped in the minutiae of history. Until 1613, the Romanovs were boyars, members of the highest rank of Russian aristocracy below princes, and were offered the tsardom by the zemsky sobor, a kind of state parliament, who gave the crown to family patriarch Mikhail Romanov. His grandson, Tsar Peter I (Peter the Great, whose portrait shows up in the opening credits of The Romanoffs), transformed the country from a feudal nobody into a formidable continental power, establishing the Russian Empire, which was a major player in European politics for centuries. The Romanov family reigned in Russia for more than 300 years, until Tsar Nicholas II abdicated his throne in 1917 after the February Revolution -- the first of Russia's two revolts against the aristocracy in 1917. There were more than a few bumps along the way, however, that make the Romanovs an atypical royal house. For one, the male line of the House of Romanov actually died out many years before the family's final fall; Peter the Great's son and heir, Alexei, despised his father and resisted becoming his successor. He died before he could ascend to the throne (not that he would've accepted), and his son, who would become Peter II, passed away at age 14, officially ending the "true" male lineage of Romanovs. That left Peter the Great's daughter, Elizabeth of Russia, to reign as Empress for 21 years before dying in 1762. Unmarried and without children, Elizabeth made her nephew, Peter III, the grandson of Peter I, the royal heir. But Peter III was actually a member of the House of Holstein-Gottorp, a branch of the royal House of Oldenburg of Denmark. So the House of Romanov is technically the House of Holstein-Gottorp-Romanov, and has many, many, many members whose claim to the Romanovs gets muddier the further down the line you go. At the start of the 20th century, economic decline and terrible living conditions for the empire's vast number of poor citizens began causing increasing unrest. World War I changed everything, with food rationing and worker strikes eventually leading to riots and street clashes. Moscow fell into chaos in what's now called the February Revolution, the first of two revolts in 1917, and the one that caused Tsar Nicholas II to abdicate his throne. He handed the country over to the Provisional Government, and was placed under house arrest in the Alexander Palace before being transported along with his family to Siberia. The second rebellion came later that year: The aptly named October Revolution, when the communist Bolsheviks ousted the Provisional Government. Led by (among others) Vladimir Lenin, the people marched on the Winter Palace and overthrew the Provisional Government with almost no resistance. Months later, on July 17, 1918, Nicholas II and his family were led out of their rooms in their Siberian prison into the basement. There are a bunch of conflicting reports about the order of events, so no one knows exactly what happened, but according to the memory of the chief executioner, the Romanov family were told they were going to the basement for their safety, in case the house was fired upon. After a few minutes, their captors led in the firing squad. Nicholas II was the first to die, the jewels sewn into his wife's and daughters' clothing protecting them from the bullets at first. After the second round, everyone was dead, but the mystery surrounding their fate has led some to believe, for example, that the young princess Anastasia escaped. 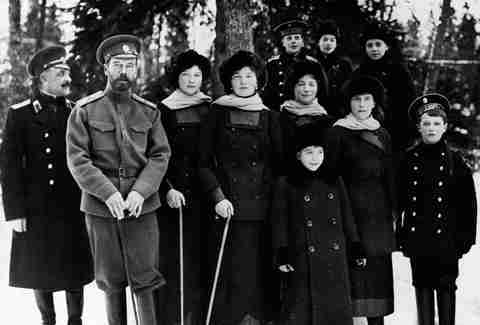 Following the execution of Nicholas II and his family, the remaining members of the Romanov dynasty went into exile all over the world, and the technical line of succession of the Russian imperial family has forever after been in dispute. There were plenty of weird rumors and generally strange stuff about the Romanov family while they were still alive: The mystic Grigori Rasputin was brought into the fold to treat Prince Alexei's hemophilia, and his reputation for sexual promiscuity led to speculation that he and the empress were sleeping together. 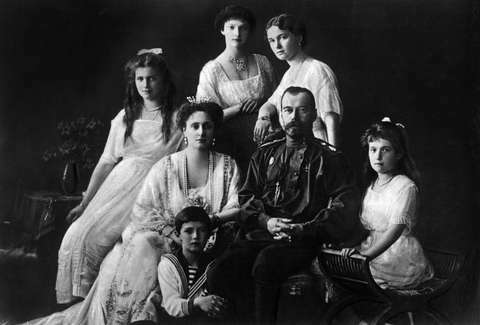 Like most European royal families, the Romanovs came from a small gene pool (a more polite way of saying they were, like most royal houses of Europe, inbred), and Nicholas II was deeply religious to the point of intense anti-Semitism that encouraged infamous, murderous anti-Jewish pogroms across Eastern Europe. For the modern world, though, the deaths of the Romanovs are veiled in a kind of dreamy, tragic mystery: The cold-blooded Bolsheviks literally shot down this gilded, bourgeoisie era, which has since been romanticized by the wealthy all around the world. This is exactly where The Romanoffs finds its home. There are plenty of other tragically murdered royal families in history to choose from, but the Romanovs are something different, almost mythic, who almost demand to be speculated about and obsessed over. The Romanoffs is, at its core, a mocking paean to modern rich, white aristocracy, inviting us into a bizarre parallel world where people keep Fabergé eggs in their china cabinets and are invited on Romanov-themed cruises and brag about their ancestors having been shot by Bolsheviks. Whether or not anybody in the show is descended from Tsar Nicholas II or Anastasia or anyone else in the family isn’t the point. But the desire to cling to a superficial, historically fraught identity gives Weiner and company the space to explore what lengths people (especially the wealthy) will go to find meaning in their lives. No one actually wants to be a princess or a tsar, at least not literally, especially because of the health hazards the jobs carry -- but the fact that the "Romanoffs" featured in the show relate to a gunned-down, inbred family of religious zealots invites us to ask ourselves how we develop our own identities. After all, even though you might not want to be a tsar or empress, wouldn't it be fun to tell your friends that you could be?